It isn’t difficult to survey the landscape of modern Africa and discern the many legacies of colonialism that continue to hobble the continent as it reaches for the future, not the least of which are the very borders that were imposed on loose tribal associations and fiefdoms by greedy colonial masters. During the 19th century and beyond, Europeans became masterful in convincing themselves that the imperial impulse — taking up the ‘white man’s burden’ — was the driving impetus behind colonialism. The so-called need to bring the twin beacons of modern progress, Christianity and civilization, to the many-coloured heathens of the globe, was rolled out on cue for the masses and indoctrinated into the children of that era. Few questioned the idea, or the arrogant perception — rooted in social Darwinism — that European civilization was the culmination of everything that everyone should aspire to the world over. And if the powers that be managed to take over some more territory and rake in vast sums for themselves and their business elite at the same time, all is as it should be. Such is the blindness of naked avarice, and the power of propaganda. The truth of history is that imperialism was largely an excuse for exploitation, and that taking up the ‘white man’s burden’ was one way to make the idea of controlling vast overseas territories with huge populations of downtrodden peoples palatable to the common European citizen. In almost every case, time and again this was proven to be a smokescreen for profit and power, and often brutality would be the engine of that change. Perhaps nowhere was this situation more evident than in the Congo Free State, later the Belgian Congo. King Leopold II’s personal fiefdom under his absolute control for more than three decades, the stories of atrocities that would trickle out of this central African region would eventually become a flood by the early 20th century. In King Leopold’s Ghost: A Story of Greed, Terror, and Heroism in Colonial Africa (1998), author Adam Hochschild steps into this maelstrom of dark forces to explore a time and place where European overlords treated their African subjects like chattel, where death and exploitation went hand in hand, while meanwhile back in Europe’s capitals imperialism was still being feted as a man-made extension of the hand of God. Exploring most closely the period in the Congo’s history stretching from 1880 to about 1920, Hochschild details the early origins of Leopold’s colony, his dictatorial control of the region once established — completely free from the influence of the Belgian government, and under Leopold’s personal boot — and the ensuing pattern of forced labour, mass murder, hostage taking, maiming and greed that festered in this troubled African backwater as violently-motivated and unscrupulous agents attempted to squeeze every possible penny from a virtually-enslaved populace. Many of the accounts in King Leopold’s Ghost do not make for easy reading, with graphic descriptions of entire villages being wiped out, of severed hands and feet as retaliation for missed quotas during the rubber terror of the 1890s, of the plundering of a people and region through brutality and greed. Hochschild even calls into question the reputation of some of the era’s famous explorers, such as Henry Morton Stanley, who had been the first white man to traverse the Congo area in the 1870s. Hochschild’s revulsion at the behavior of the explorer during his various expeditions in Africa — Stanley’s journals are replete with matter-of-fact accounts of multiple killings and attacking villages, even taking pot-shots at Africans as he floated down the Congo River — comes through in his writing. British hero Stanley would later play a startling role in the establishment of Leopold’s pet colony, helping to forge lopsided and misleading treaties with local chieftains for control of vast regions under Leopold’s suzerainty, and accepting a hefty salary to start work on building a railroad to circumvent the Congo River’s 220 miles of unnavigable coastal rapids to reach Leopoldville, what is present-day Kinshasa. Unfortunately it is part of the recent African experience for former colonizers to try to obfuscate the dark acts of the past. Leopold’s Congo may have been one of the more high-profile examples at the time — stories of its brutality would spawn a worldwide protest movement in the late 19th century, which became the cause célèbre of the age and would eventually wrest control of the colony from Belgium’s aging king and place it in the hands of civilian authority. But the Congo was hardly the only example. Germany was extraordinarily brutal in its treatment of its colonial subjects in Africa, as were the Portuguese, while France and Britain often used some of the same methods as the ivory and rubber agents of the Congo. As for Leopold, he used his absolute control of the colony — one in which he would never set foot in his lifetime — to enrich himself and his family while building grandiose public follies of dubious value. 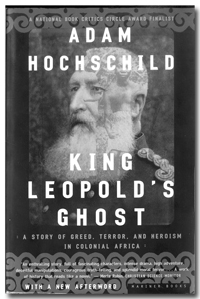 In King Leopold’s Ghost, Hochschild refers to modern European efforts to erase any negative vestiges of their colonial past as ‘the great forgetting’. Like most historians, Hochschild decries efforts that try to soften or downplay the deeds of history, and he is right in pointing out that in re-writing some of that record, the lessons that could be learned are now easily missed. One of the problems of African history, however, is finding sources that aren’t written by colonial masters or missionaries. In many cases they simply don’t exist. Which brings us to one of the other problems of gauging the scale of the tragedy that occurred in Leopold’s Congo. Through painstaking assessment of regional population figures from the time and drawing on multiple unrelated sources and exhaustive research, Hochschild estimates that the wages of exploitation in the region amassed a death toll of more than 10 million. That, however, is a conservative estimate — some researchers insist more than 13 million Africans lost their lives in the colony over less than three decades. The past weighs heavy on the Congo, and today the former colony is a chaotic failed state where death and tragedy are no stranger to her people. When finally lifted from the colonial boot of Belgium in the early 1960s, the Congo would in short order — and with the help of a CIA-backed coup — fall under the absolute control of dictator Mobutu Sese Seko, who would plunder the country and its people until ousted in the late 1990s. Today’s Congo is hardly any better, now locked in a state of perpetual civil war and with varying reports suggesting much of the population is now verging on starvation. While this experience could hardly be called unique in post-colonial Africa, the Congo’s long suffering seems to have held on by the teeth while other neighbours have managed to shed themselves of authoritarian dictatorship and move forward with improving the lives of their citizens. How much of this legacy can be traced back to the region’s history isn’t something that can be easily measured. A vivid but troubling account of the virtual holocaust that was perpetrated on the Congo by a would-be colonizer king who managed to cultivate a reputation as a great humanitarian — a reputation that still persists to this day — King Leopold’s Ghost is essential reading for anyone hoping to understand the forces at work in the region today, as well as casting doubt on the sometimes-glowing review that colonialism and imperialism still enjoy in some modern circles.